Teacher Talk Tuesday: Classroom Community! I remember when I was starting out as a teacher (we won't talk about what year that was) and I found out there were these things called "blogs" that teachers used to share what was going on in their classrooms. I was looking for behavior management ideas and stumbled across what used to be Ms. Powell's Management Ideas for Teachers (now The Cornerstone), and I was hooked. I've spent countless hours checking out blogs over the years and this summer decided to take the plunge and start one! Blogs have always been my go-to for new ideas, which is why I'm so excited to link up with Second Grade Stories for Teacher Talk Tuesday! I can't wait to see what ideas my fellow bloggers and teachers have for one of my favorite topics...Building a Classroom Community. In my class, students work collaboratively on almost everything, so it's extremely important they they learn to work together (which I explain to them is NOT the same as working next to each other!) as quickly as possible. Here are some things I have done in the first few weeks to encourage that community vibe. I have several activities I've used on the first day for as long as I can remember. The first one is always a big hit. I'm not quite sure where I got the idea from (I know it was a blog!) but how it works is you have the students form groups of 4. Each group gets 100 straws, tape, and scissors. The goal is to build the tallest free standing structure they can. The catch? No one is allowed to talk. If a group member talks, I take away one of their straws. I love this activity because by observing the students and how they interact with each other I learn a lot more about them then I do from an articulation card. Who are my leaders, and who hangs back? Who gets frustrated and gives up? Who are the "idea" people? The best thing is that rarely, if ever, do groups build similar structures. It's a great thing to bring up in a class discussion...we can all have the same directions but our outputs may be dramatically different! I also like to have the students do some form of a "Find a Friend Who..." activity (a good example can be found HERE). Students take their recording sheets around the room and have their classmates sign the various categories. It's a way for students to get to know each other, and for them to get out of their seats! I also have the students interview each other and share the results. I need my students to understand from Day One that speaking and listening are a huge part of our day. As students share, we talk about what makes an active listener, and why that is so important to our classroom community! Another activity I do that students love is acting out the rules. This is also a group activity. Each group gets a rule and has to come up with a short skit demonstrating someone following the rule, and their favorite part...someone who is NOT following the rule. As you can imagine, they love having the permission to "break" a rule, and get some laughs in the process! 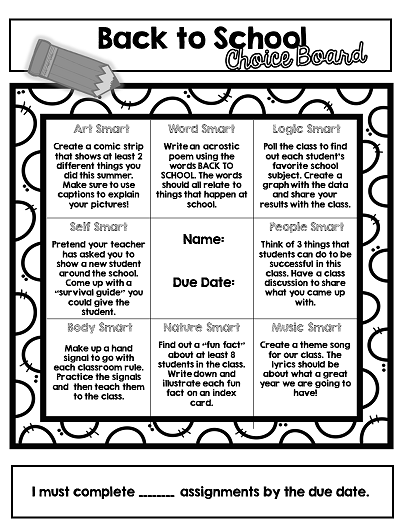 This year I'm looking forward to using my Back To School Choice Board as a way to do more team building. 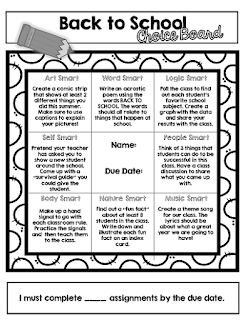 There are 8 activities (corresponding with the multiple intelligences) that students will work together on and present to the class. I'm excited to see what they come up with! Again, the great thing about these types of activities is that no two ever look alike. I like fitting in ways for the students to be creative as much as possible. Thanks for reading! Please join us over at Second Grade Stories to share what you do to build a classroom community. When I started teaching, I'm not sure there was even such a thing as a teacher blog! I do remember searching online for ideas though. I had a dial-up modem which was REALLY slow. I love your straw idea. I think I'd like to incorporate something like that. Thanks for sharing! Oh man, I remember dial-up modems! Kids today will never know the struggle, lol.